The record for the longest marathon run is held by Shizo Kanakuri with a time of 54 years, 8 months, 6 days, 5 hours, 32 minutes and 20.379 seconds. During the 1912 Olympics, he quit midway through a marathon race and went home to Japan without notifying the officials. He was considered a missing person in Sweden for over 50 years. In 1966, he was invited to complete the marathon. Shizo Kanakuri was a Japanese marathon runner and one of the early leaders of track and field athletics in Japan. Kanakuri was a native of Tamana, Kumamoto, Japan and attended the University of Tsukuba. 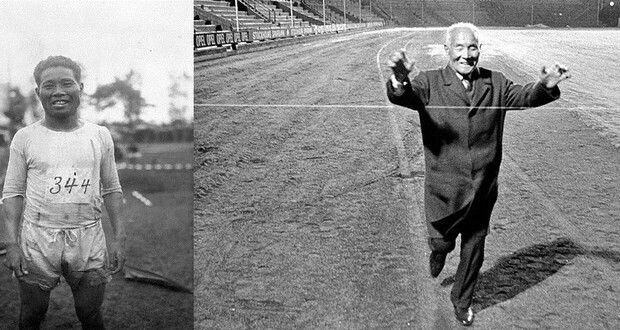 During the November 1911 domestic qualifying trials for the 1912 Stockholm Olympics, although the length of the course was probably only 40 km, Kanakuri was reported to have set a marathon world record at 2 hours, 32 minutes and 45 seconds. Kanakuri is best known for disappearing during the marathon race in the 1912 Stockholm Olympics. Kanakuri had a rough 18-day-long trip to Stockholm, first by ship and then by train all through the Trans-Siberian Railway, and needed five days to recover for the race. Kanakuri, weakened by the long journey from Japan, and suffering from problems with the local food, lost consciousness midway through the race, and was cared for by a farming family. Despite this setback, Kanakuri was selected to participate in the 1916 Summer Olympics, which were subsequently cancelled due to World War I. However, Kanakuri did compete in the 1920 Summer Olympics held in Antwerp, Belgium, where he finished the marathon race in 2 hours, 48 minutes and 45.4 seconds and placed 16th. Kanakuri subsequently participated in the 1924 Summer Olympics, where he failed to finish the race. Kanakuri is also known for his role in establishing the Hakone Ekiden relay marathon in 1920.